Delicious Cheese, originally uploaded by cwbuecheler. Shavuot went by this year without me doing anything about it at all. I was too busy getting over the jet lag from my trip to France (waking up at 3-4am every morning is no picnic! ), Portobello West market today and all the preparations beforehand. I did not bake a cheesecake, or make blinztes, or eat any cheese. And I might as well. 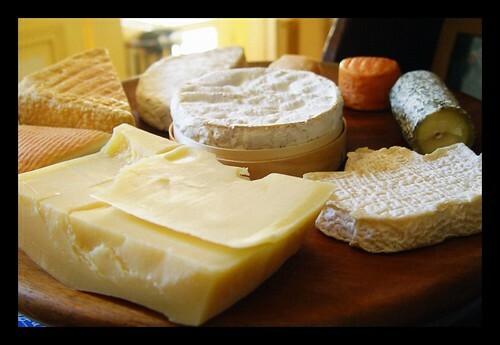 I probably had enough cheese in France to last for the rest of the year (it was my nearly only source of protein there - aside from eggs and some almonds when I found them). 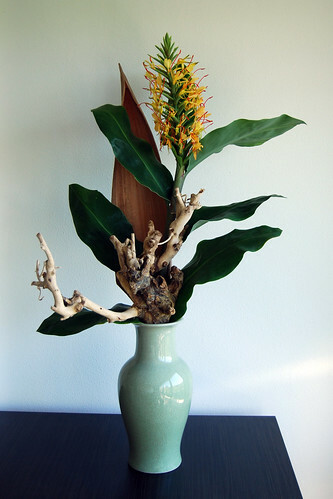 Ikebana 'Ginger Lily and driftwood', originally uploaded by Otomodachi. Ironically, it is here where I smell ginger lily, not in Dark Amber & Ginger Lily. Ginger Lily has more in common with ginger than with lily though, it’s more of a spicy, warm, rooty and sharp note rather than a floral, heady or pretty like you might expect. Initially, Lotus Blossom & Ginger Lily is lighter and fresher than Dark Amber & Ginger Lily, but also a little odd. While I find the use of ginger lily unusual and daring, I am disappointed (though not surprised!) by the aquatic notes and even more so by the very obvious patchouli undercurrent. Patchouli and water notes to me are less appealing than mud. At least there is something genuine about mud; the artificial aquatic florals seem pretentious and trying too hard to please. And in this one even more than in Dark Amber & Ginger Lily – the Koh Doh connection remaind a complete mystery to me. There is something that feels unfinished and disharmonious about Lotus Blossom & Water Lily, although I imagine it to be well received (otherwise, this limited edition wouldn’t have come back again this spring, or would it?) and because of its striking similarity to other popular mainstream scents (i.e. : Coco Mademoiselle). Some aloeswood perhaps peaks at the end, but again it does not feel authentic - it has that sweet berry note that seems to be the way agarwood is perceived nowadays ever since M7. So far from the truth. sweet alyssum, originally uploaded by powerbooktrance. Dark Amber & Ginger Lily comes in a striking black glass bottle, which makes it stand out from the rest of the Jo Malone cologne collection, at least visually. But it is also very different in style. While I can’t say that Koh-Doh incense comes to mind when I smell it, it does have a similarly stylized, modernized Orientalism that characterizes another British niche line – Ormode Jayne. Dark Amber & Ginger Lily opens with a the spicy-fresh notes of pink pepper and cardamom, reminding me simultaneously of Ormonde and Ta’if. The spicy sharpness is sheer and underneath it a woody-berry note that is the only moment when I sense some oudh. 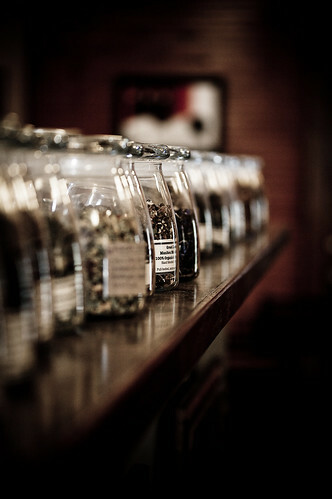 What comes next is mostly musk and a modest dosage of florals – primarily jasmine. The dry down is an almost powdery, perhaps even aldehydic musk reminiscent of opoponax, patchouli and woods combined. 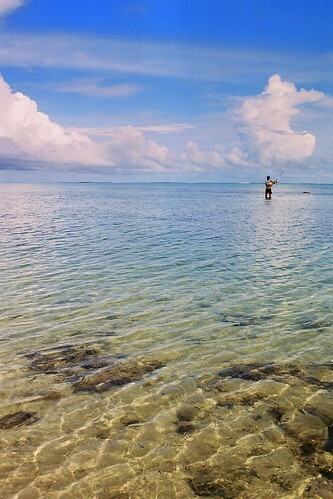 Pêcheur dans le lagon (Moorea - Polynésie Française), originally uploaded by D. [SansPretentionAucune] (•̪●) ✪. In recent years, I've developed a taste for little summery body sprays that may not really stand as a perfume on their own right. I must not be the only one, since these become more and more popular it seems, judging by the introduction of new ones every spring. Terracotta Eau Sous le Vent is what my dream beach-vacation scent smells like. The gardenia and coconut creaminess of Monoi de Tahiti paired with the sweetness of a fresh juicy mango dripping down my elbows as I watch the sunset. It's an ideal beach holiday. For me, anyway: sand, sun, tropical fruit and a scent to match. I took it with me to the French Riviere just in case I find time to go to the beach after school and indeed I was fortunate enough. On Friday, my very last day, I headed to Cannes equipped with this beautiful bottle in my beach bag, a large straw hat and a bikini. I sprayed it on and watched the sunset and the fancy cruise ships and yachts pass by, leaving the red-carpet and paparazzi crowds of the 62me Film Festival behind, and not waiting long enough for the Cinéma de la Plage to start. And just an aside: Unlike Azuree de Soleil (now called Bronze Goddess) isn't even oily so it's really easy to wear. I'm not sure about its moisturizing or tanning properties. I just love the smell of it. My visit to Grasse seemed to be in a perfect timing: not only is it the rose harvest season (which only lasts 3 weeks), but also that week was the week of Expo Rose – a rose show with rose experts and growers from around the world showcasing incredible hybrids of fragrant and colourful roses. The English roses were particularly impressive, with hundreds of petals condensed and arranged in such a stylized way as to resemble flowers made out of rolled crepe paper or metallic Art Nuveau sculptures. In this blog entry are just some photos of how the city centre looked like May 21 - 24. And the city’s businesses, shops, museums and restaurants all had rose petals decorate the tables or reception area. At the end of the day, the street grounds were dotted with rose petals too. Quite a sight! Rose petals in a water-fountain. How very luxuriuous! Terracotta coloured rose. Never seen a colour like this (but it's really difficult to transfer through the camera). Fake rose trees that decorate the little alleys, staricases and passages in Old Grasse (aka downtown/city centre). La Bastide du Parfumeur is a conservatory and a botanical garden nestled between Grasse and Cannes, that has opened just recently - in 2007. This is an unusual botanical garden. Expect none of the manicured and controlled French garden like those in Paris. What you’ll find here is a wild paradise of fragrant plants and flowers, arrange visually like one beautiful meadow that spills from the hills with endless surprises of unusually fragrant plants (most of which are famous for their use in perfumery, others less known or exotic – such as Seringat and Hymmemosporum). And between them grow in careless abandon unlabeled roses of surprising colours as well as wild oats and other weeds. The beauty of the place is breathtakingly unconventional. And it is arranged according to odour, a classification quite unusual for any garden. You’lld find rustic signs for vanillic notes, woody notes, citrus notes, herbaceous notes, spicy notes and so forth. The list of sponsors is impressive on its own right (including perfumers such as Le Cristophs for examples), and also from talking to the gardeners I understand that Michel Roudnitska played a key role there in consulting about what plants to use and how to group them together. Below are just some of the highlights to hold you over until you go there. Because you must do that. The garden begins with mint groves that smell more impressive than they look. The Japanese mint is especially green, crisp and sweet and with hardly any camphoreous menthol aspects. And some are more sharp and strange than others. The picture above is of Bergamote Mint, which smells convincingly of bergamote. I'm guessing its the result of high presence of Linalyl acetate. Next come some spicy and woody notes (I was happy to find Zantoxylum in the raw living form for the first time). Other beautiful spicy notes belong to the many carnations the trimmed the plots, both pink and white (I spotted 3 types but all photos of one of the fuller-petaled pink ones turned only blurry). The garden of white flowers included jasmine (not in bloom at the time visited), star jasmine and white roses. The fruity notes included sweet juicy strawberry, loquat and Ananas Sage, which is very unusual and mouthwatering with its pineapple-like notes. Of course I couldn't help myself and had a little picnic. I really liked how the iris was planted right next to the acacia garden. There are common characteristics for these two notes - powdery, woody and floral and cool. There was only one bush in bloom, since the mimosa season in Grasse is January-February. This is Seringat, a bush I'm unfamiliar with and am at loss describing its scent. It was floral and a little fruity - perhaps peachy - but I can't remember being able to come up with any other adjectives. Next come the herbaceous notes, and there are plenty: rosemary, helicrysum, lavender, sage, clary sage, Roman chamomile, etc. and many types of pelargonium, including this strange looking one, Eucaliptus scented pelargonium and one that didn't have a sign and smelled intensely of animalic musk. This particular helicrysum really smells like curry more than others. I was surprised at how soft this dangerous plant smells. Sweet and almost coumarin like, despite all the thujone. Notes Hesperide, which is French for citrus notes - here are bitter orange trees with lemon verbena in the space between them. Across from there is a plot with melissa (lemon balm) and lemongrass. This exotic Australian tree was planted right next to the citrus plants, although it smelled more like a mixture of ylang ylang gand vanilla. There were also many fragrant pittosporums around this area, so judging by the plant's family, this must be the connecting reason. Or perhaps the orange blossom like aroma of some pittosporum blossoms. There is no mention of pittosporum on the garden's map. Going down to the left side of the garden, there are open fields, less structure, and many wild flowers. I pass by sitting spots, some look sureal and all very beautiful - my favourite being two chairs in the middle of a lavender field. There is one plot for Jasmine (not blooming now), lavender fields and more herbaceous fields including more curry plants, sage and rose geranium. The garden ends with two large plots for Rose de Grasse (Rosa centifolia, aka Rose de Mai), and many wild poppies in pink and red. On Thursday, I shook hands with Clary Sage for the first time. As you can see, her hands are much bigger than mine! This exciting encounter took place at the tropical perfume garden of the Musée International de la Parfumerie in Grasse. The International Perfume Museum in Grasse re-opened in 2008 and is unusual from other perfume museums in the world in that tries to show the history, archeology, cultural and technical aspects of perfumery not only through bottles (although mostly bottles, as expected) of perfume and cosmetics, but also allows visitors to smell some scents. The press release for the museum promised more than I found there, but I still felt the museum offered an unusual and valuable experience as well as being educational and informative (if you can understand French – only the very main writings was in other languages – and so I missed any commentary on the enfleurage process, for instance – not to mention the many curious artifacts ranging from Ancient Egypt and Greece to medieval Europe and Asia). A few curious items that impressed me: the mummified feet and hands (covered and stuffed with fragrant herbs for preservation), and very old fashioned mascara used to be pressed powder plus brush that women would wet with their saliva to paint their eyelashes. There were many elaborate accessories and bottles for cosmetics on display that looked like silver tea sets, but were in fact a medicinal/cosmetic treatment kit. The lack of commentary in English (there may have been some in German though) clearly was not in my favour. But what I mostly came for was what I read about in the press release announcing the re-opening, that mentioned smelling stations or mechanisms around the museum where visitors can dispense scent into the air by a push of the button. None such thing existed. And when I finally gave up and asked the front desk about it, they said it is yet to be built. A later conversation with a tour-guide at Fragonard informed me that ultimately this museum will also include a division of the Osmotheque. That could be so fantastic! While I never found Marie Antoinette’s vanity chest mentioned in the radio show, but I went to a pink vanity room where you can open the drawers to see scented fans, and flip up a chest cabinet to reveal entire collections of cosmetics and perfumes from long ago. I also did find an old fashioned perfumer’s organ which was very impressive. The only exceedingly aromatic exhibit was the sensory auditorium, where a short osmo-art film is shown: nature scents on two adjacent walls, accompanied by music and scent, of course. Beginning with ocean (too much calone for me), proceeding to woods (incensy, sappy and warm – almost smoky), a field (which I am unable to describe since by than the room was saturated with both previous smells) and finally, an energetic and juicy cantaloupe piece that was my favourite. While I found the vast number of stunning perfume bottles overwhelming I was especially moved by the gardens dedicated to exotic aromatic plants that I haven’t had the chance to ever see alive and growing, i.e. : clary sage, with whom I shook hand for the first time in my life, vetiver, patchouli, vanilla orchid, cinnamon tree, cardamom, tuberose and ylang ylang (though not flowering) and bergamot to name a few. The museum seems to be still under development and I can only hope that next time I’m in Grasse the museum will be even more complete and with more olfactory adventures.